A lover of the old phones? Do you like to hear the sound of the retro phone? 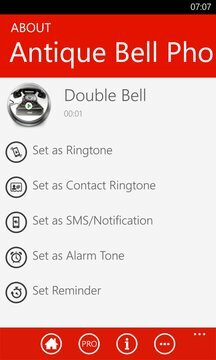 With this great Old Phone Ringtone App - Free Ringtones you can download free ringtones and make your modern phone sound like those old school phones. The free ringtones that you’ll find in this awesome app are all that you need! Old telephones are back in the game! It is extremely cool nowadays to have your telephone ringing as an antique phone. If you want to be the most popular guy in school then you should most definitely have one of those rotary phone sounds. The number of different sounds of telephones is enormous! And the options of what you can do with them are also huge! You can set home phone sound as an incoming call ringtone. Your SMS ringtone can be the innovative future phone sound. As the contact sound to your grandparents you can set vintage phone ringtone. With this great app you can now immediately know that it is your office calling you, without even looking at the screen but just by hearing the melody. Simply set either classic office or digital office sound and that’s it! 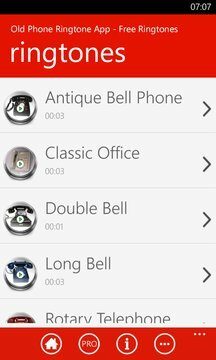 We can guarantee that you will love these nostalgic ringtones, especially the most famous one – the bell phone! The possibilities that you have with Old Phone Ringtone App - Free Ringtones are endless. Try these best ringtones and you won’t be sorry! This application has been tested on the following phones (Windows Phone 8, Windows Phone 8.1): HTC 8S, HTC One M8, Nokia Lumia 520, Nokia Lumia 720, Nokia Lumia 1020, Samsung ATIV S and Huawei Ascend W1. Compatible with Verizon, AT&T and all other providers. Sound clips used in Old Phone Ringtone App - Free Ringtones Windows app are under public domain license and/or Creative Commons’ license.